Please register in advance in order to attend the symposium by December 11, 2018 at 2:00 PM Japan time. Please fill out the information below and send us an e-mail. Please send your e-mail. Click here. PANEL DISCUSSION Part I: What can Japan learn from other countries? ・How would the Japanese arbitration system change after setting-up the Japan International Dispute Resolution Center (JIDRC)? ・Any legal issues arbitration practitioners may face such as challenging arbitration award. ・How Japanese youth who is interested in arbitration could be competent arbitrators? Tips from arbitration experts. Language: English. Simultaneous Interpretation (English/Japanese) service will be provided. 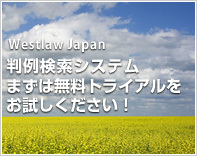 © 2019 判例 法令 検索オンラインシステム WESTLAW JAPAN K.K. ALL RIGHTS RESERVED.